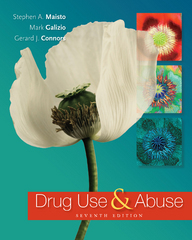 Drug Use and Abuse 7 Edition DRUG USE AND ABUSE takes an interdisciplinary approach in its coverage of current drug issues. It weaves psychological, historical, cultural, social, biological, and medical perspectives -- emphasizing the idea that a drug's effects depend not only on its properties, but also on the biological and psychological characteristics of its user. This theme is highlighted throughout, and is prominent in discussions of the individual classes of drugs, as well as in the chapters on pharmacology and psychopharmacology.